Picture this: You’re a major gift officer on your way to a donor meeting and you’re lost. So, you ask for directions. A heads-up display in your glasses gives you a map to your donor’s front door. You park your car, pull up the donor’s record — again, on your glasses — and spend a few minutes reviewing the information. You capture the meeting with a camera on your trusty magical glasses and you’re able to devote all your attention to the donor, not to a pen and paper or a recorder. Wearable technology was the new hot trend in the tech world in 2013, and it is only gaining steam. From fitness trackers to heart monitors to smart watches to Google Glass, wearable technology is poised to become as ubiquitous as clothing, and nonprofits need to jump on the bandwagon. 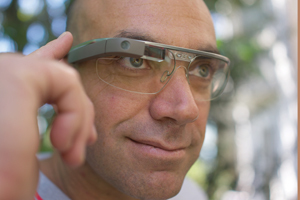 Chris Tuttle, a New York City-based technology consultant, said that while nonprofit executives are excited about and want to use Google Glass, “Few have found ways to effectively (use the technology) as of yet due to limitations with Glass.” Some barriers that Tuttle assesses include the technology’s cost (about $1,500); short battery life when using video (less than an hour); inability to easily switch between users; poor sound recording; and, limitations of Glass’s video conferencing technology, Hangout On Air. While wearable technology might not yet be making major gift officers’ lives easier, it is already being implemented by nonprofits and is saving lives. Nancy Capelle of Wilton, Conn., was 40 years old and physically fit when she had a heart attack. Cardiologists determined she had a rare condition called spontaneous coronary artery dissection (SCAD). Capelle said the device is unobtrusive, about the size of a small purse. Patients generally wear a LifeVest, or wearable defibrillator, for one or two months, and it transmits cardiac data to the manufacturer, which can be accessed by the patient’s medical team. If the patient experiences an abnormal heart rhythm, an alarm sounds, and if the patient fails to turn the alarm off, the vest will defibrillate the patient. Nonprofit advocacy, by the American Heart Association and others, was integral in preserving the Medicare policy regarding wearable defibrillators. The Durable Medical Equipment Medicare Administrative Contractors of the Center for Medicare and Medicaid Services considered changing the Medicare policy in 2011 in a way that would restrict access to wearable defibrillators for a number of patients. Due in part to nonprofit advocacy, the draft policy change was withdrawn. Wearable technology can save lives in other ways, too. When Matt Asner’s autistic son wandered away from the family home, Asner, executive director of Autism Speaks Southern California in Los Angeles, wished his child had been wearing a GPS tracker. Asner’s son was found unharmed a number of hours after it was discovered he was missing. Autism Speaks does not distribute GPS trackers or help families with the funds to obtain them. Asner said the organization’s partnership with the National Autism Foundation should help families get GPS trackers for their autistic children. The National Autism Foundation did not return requests for comment. The Christopher and Dana Reeve Foundation is keeping close watch on the possibilities of wearable technology for its constituents, those suffering from spinal cord injuries or affected by paralysis. It has funded some 15 Quality of Life grants totaling more than $135,000 specific to wearable technology initiatives, including eye tracking technology and head-pointer equipment, both of which enable paralyzed patients to interact hands-free with their environments, as well as voice-activated typing technology. Cost is always a factor. “The problem is a lot of (GPS trackers) are expensive,” said Asner. “Families need help to get them.” Another problem is the trackers’ form. Asner said many autistic children “are very particular about what they put against their bodies.” The tracker must be unobtrusive, something that a child won’t mind wearing, and something that won’t fall off. Asner suggested an insert for a child’s shoe. Wearable defibrillators can cost as much as a new car. According to Capelle, they go for between $40,000 and $60,000 for medium-term use. Capelle’s insurance covered the defibrillator, but for the uninsured, the cost almost certainly puts the technology out of reach. Wearable technology might be the future, but it’s not quite the present for nonprofits. That could change soon, said Kathryn Engelhardt-Cronk, CEO of Austin, Texas consulting firm Community TechKnowledge (CTK). Engelhardt-Cronk believes that wearable tech adoption will be much faster than other technology adoption.